There are many challenges currently going on in Facebook, among photographers. One of them is the black and white challenge, where you need to post a black and white photo and nominate another friend for five days. Though I do not want to share the nominations here, the black and white photos posted are the below ones. 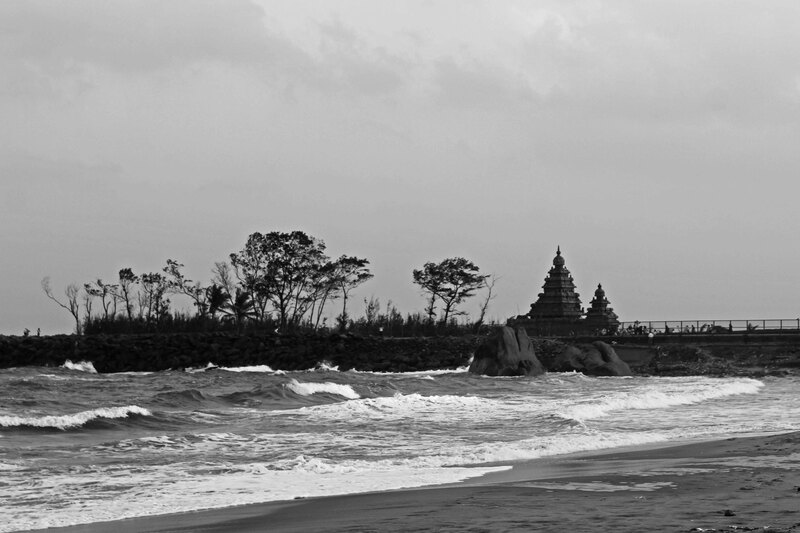 The above image is of Shore temple, Mahabalipuram, near Chennai in December 2012. With the kit lens (18-55m) I had, I was not able to get the details of the shore temple. Also, it was either a cloudy day, or we went to the beach very late, almost after sunset. I tried converting to black and white, so as to give a silhouette touch, though I know its not that perfect. It was the first travel we did with the DSLR, Canon 600d, and hence I was not aware of taking landscape photos in RAW images. So considering that its the one of the initial shots, I am happy with it. I had posted a photo of my daughter for the second day, but I do not want to share that in the blog. Hence I would chose this abstract image, depicting ways of life. I had no image containing shadows, to participate in the CCH flickr group. Hence was thinking about how to create one, and sipping my morning tea in my balcony , when I saw the shadows caused by the morning sun and the window grill on the balcony floor tiles. Its amazing how photography can make you form images from the normal mundane things of life. The initial image did not had much contrast as the floor tiles were white. 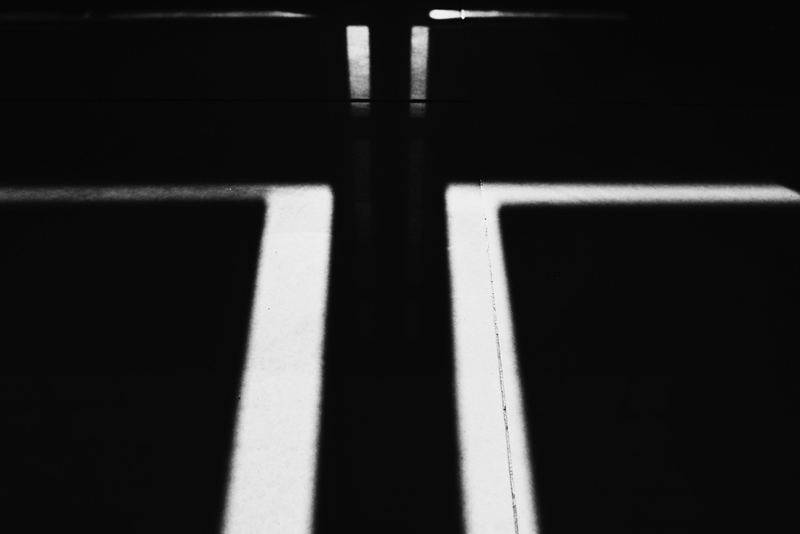 The paths in different directions, some very strong and some light looked like paths we are presented with to choose at various conjunctions of life. 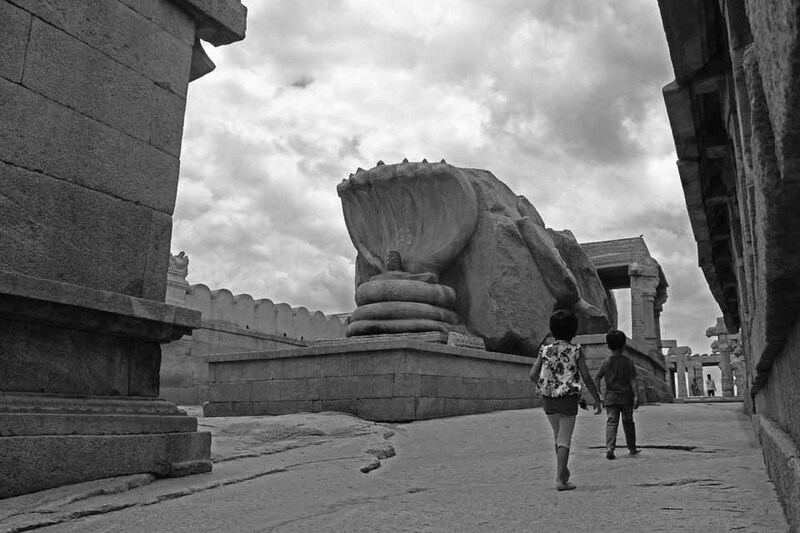 The above image is taken at Lepakshi temple, Anantpur, Andhra Pradesh during our recent Lepakshi trip. I could not get any straight shot of this famous monolithic seven hooded serpent and the shiva linga, as there were people and kids sitting on top of it. We were pressed for time leaving me no chances to wait for the stage to get cleared. This image was taken just few minutes earlier. During my initial scouting of images, I was not impressed with this, as there were kids running about, but on a different day, I considered them as a plus point for the image. I am not sure, whether this is a common trait in photographers, but my mood swings and mental state largely impact the choosing of the images, and also the final outcome of the post processing of the photos. Though I never planned to convert this to black and white, I was not being happy with the color processing of the photo on that day. The clouds were not that blue, and unfortunately, I missed this taking in RAW format, to recover the dark details later. Street photography is an upcoming style of photography commonly practised these days, along with the popular wedding photographer category. Most of the weekend photo walks happening in cities revolves round this style, though very few really understand them. Initially I thought about it as random shoots of people and things on the streets. But its much deeper than that. There are very good street photographers, who can convey lot of life contrast, stories and funny images from the streets. What I realized is that you need to have a sharp eye to lookout or anticipate for the images and also good knowledge on photography to compose the photos in a fraction of a second. The above image was taken at Gandhi Bazar near Bull Temple, Basavanagudi, Bangalore. 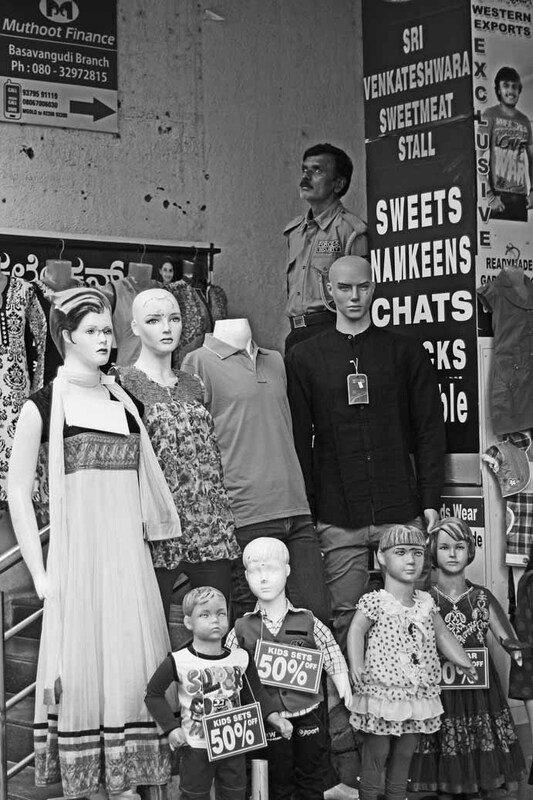 The positioning of the old security guard along with other mannequins provide a stark contrast to his value as a human being. Atleast that is what I thought so, when I clicked it. In the month of Ramzan, we hit the streets of Frazer Town, Bangalore on one of the photowalks, and this was the only good image I could make from that walk. One of the popular images from my database, this photo has made it to the few photos to be exhibited in FOCUS Bangalore Annual Exhibition, on November 28th to December 2nd 2014 at Venkatappa Art Gallery. Please drop by at the “Beyond Colors” Annual photography exhibition at Venkatappa Art Gallery, Kasturba Road, if you are in Bangalore. 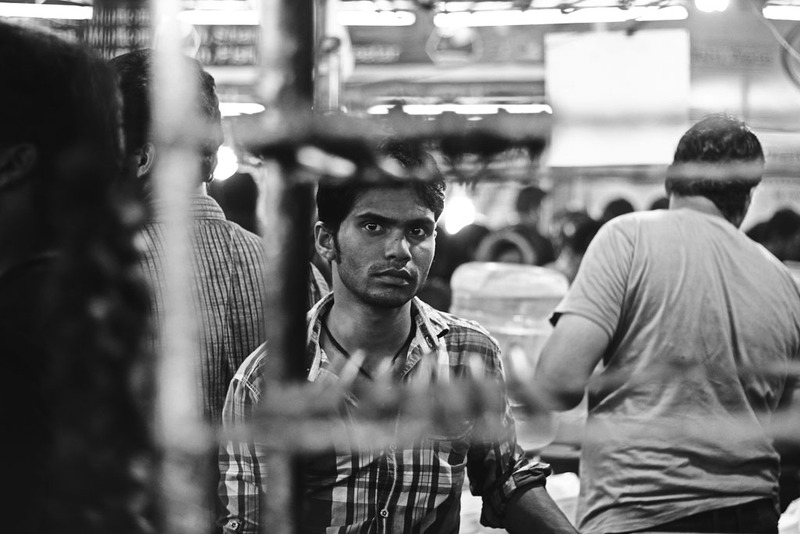 You can see lot many photographs from other talented photographers from Bangalore. And the entry is FREE! !